beginning years of the Yuan Dynasty (1271 AD - 1368 AD). Furthermore, due to its various economic functions, connections to the ancient silk road and other historic factors the Xuanwu District is also traditionally home to the largest number of ethnic minorities. Find Niu Jie - Ox Street - Mosque, Bao Guo Si (Market) and Fayuan Si - the Buddhist Temple of the Source of the Law, at the very heart of the old Liu He Muslim Village that formed a seperate village inside the District and received the trading Camels from the Silk Road. (See Beijing Planning Exhibition and Hall). In the Eastern Part of Xuanwu District, along the cities central axis and the former main route of entry into the Walled Inner City, lies the TianQiao Area of Beijing. Tianqiao, once the meeting place and main performace area of street artist, grew into the home of Beijing Culture, and is now still home to most renowned Theaters. Others have ofcourse appeared throughout the City, but the highest podia, such as the Wansheng Acrobatics Theatre (home of the famed Beijing Acrobatic Troupe) are at Tianqiao or at least located inside the Xuanwu District. 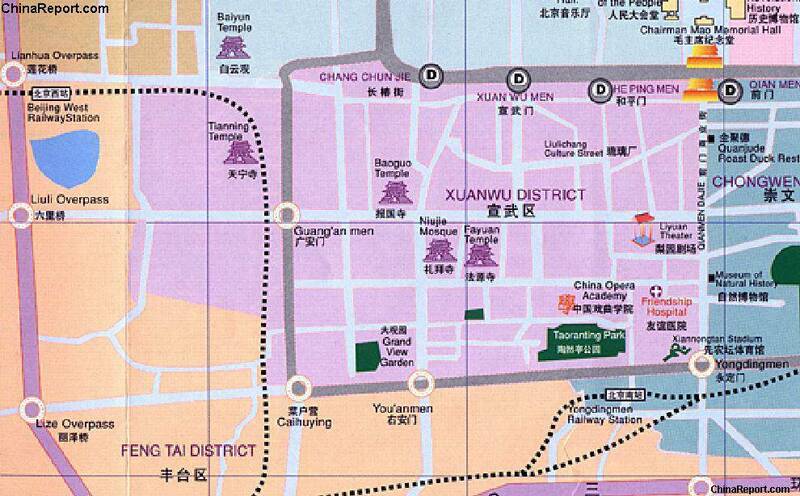 Note that most of Xuanwu District is surrounded by the 2nd ring road of the City, which was constructed on the space left by the demolishing of the old Ming Dynasty Era City Walls. As a result of this most of Xuanwu is nearly square shaped. However due and oddity of history (there was a main camel route and a bridge leading west from Xuanwu, near Liuli overpass) the TianNing Pagoda and Temple of the West Border and nearby BaiYunGuan, Temple of the White Clouds and China Buddhist College have ended up as part of the Xuanwu District. These two, however, for all practical purposes lie outside the 2nd ring road and appear as if they were part of the Fengtai District. Along the southern border of the Xuanwu District the City Wall have disappeared a long time ago. However, a remnants of the city moat remains. Walk along it to end up at YongdingMen or go upstream and follow the water all the way into Haidian District.